In October 2018, Arby’s tested a very unique sandwich at one of its Berks County locations. The Arby’s in Spring Township sold – and sold out of – the one-time-only duck sandwich. It was a very different concept, especially for a national fast food chain. But it was met with positive reviews, and the line that morning when Arby’s opened up said there was a demand for it. That’s where the Kwik Shoppe in Shoemakersville comes in. They saw opportunity and capitalized on it, introducing duck on their menu in November. While duck is normally found on finer dining menus – five-spice duck breast at Savory Grille and ravioli with duck ragu at Salute come to mind – it’s not the first time I’ve had it in a more casual setting. At the Liberty Taproom, I enjoyed a duck confit burger topped with duck sausage. And my first real taste of duck came at the relaxed Canal Street Pub. But fast food is a different story. 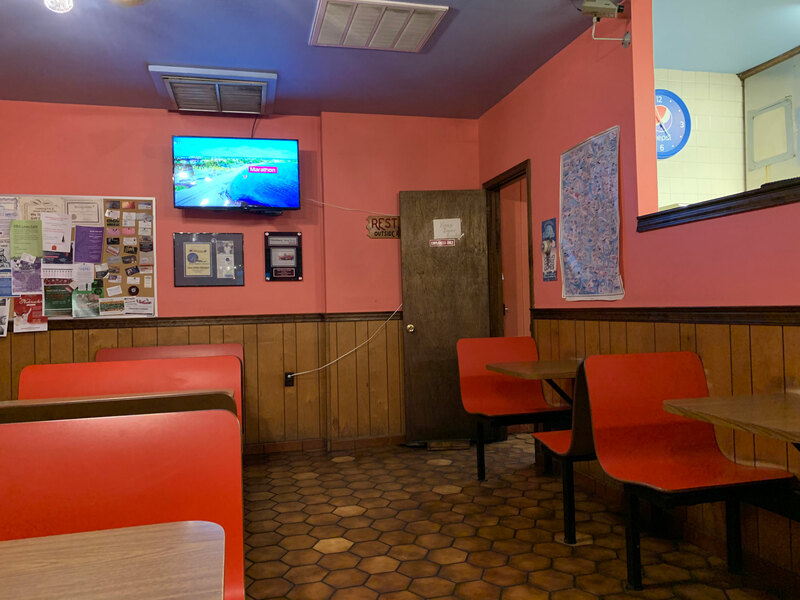 Walking into the Kwik Shoppe – a quintessential drive-in with hexagonal tile floor, booth seating and a claw machine behind the door – duck just doesn’t seem to fit. 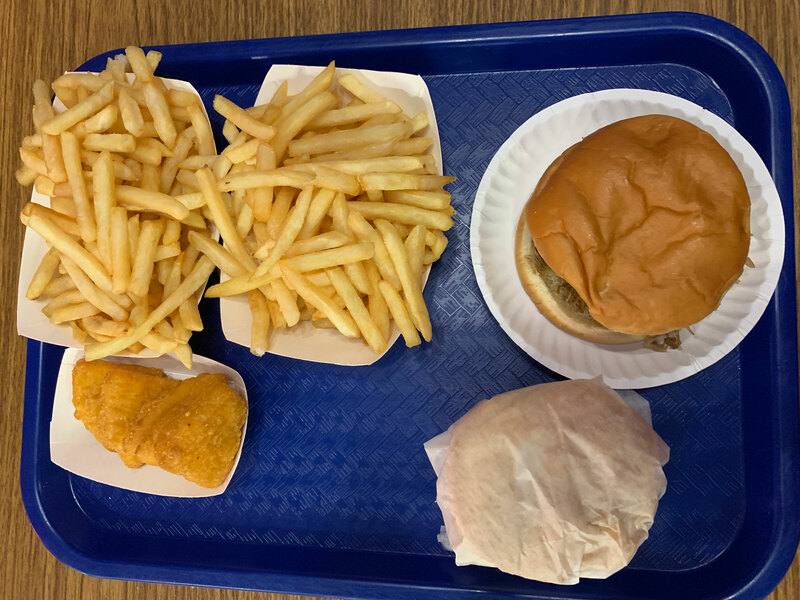 The Kwik Shoppe has three different duck items on their menu: the pulled duck sandwich, duck fries and a duck sausage sandwich. All of them sounded good, but a photo of the pulled duck sandwich on the restaurant’s Facebook page had me sold before I got there. 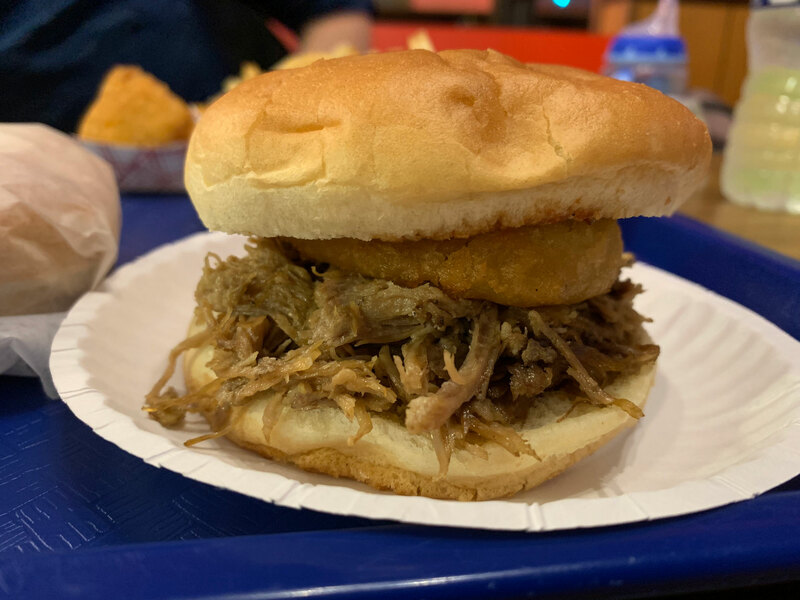 The sandwich was topped with an onion ring and pineapple papaya sauce (barbecue sauce was also an option). Before diving into the sandwich, I tasted the meat on its own. It was similar to a pulled pork but fattier with a deeper flavor. I was impressed. On the whole, the sandwich was very good. There wasn’t a lot of sauce, but there didn’t need to be. It added some sweet and tangy notes that came through after the meat. The onion ring was a reminder that I was eating fast food. It wasn’t necessary, but I certainly didn’t mind it either. I would go back for another. Julie went with the much less exciting cheeseburger. 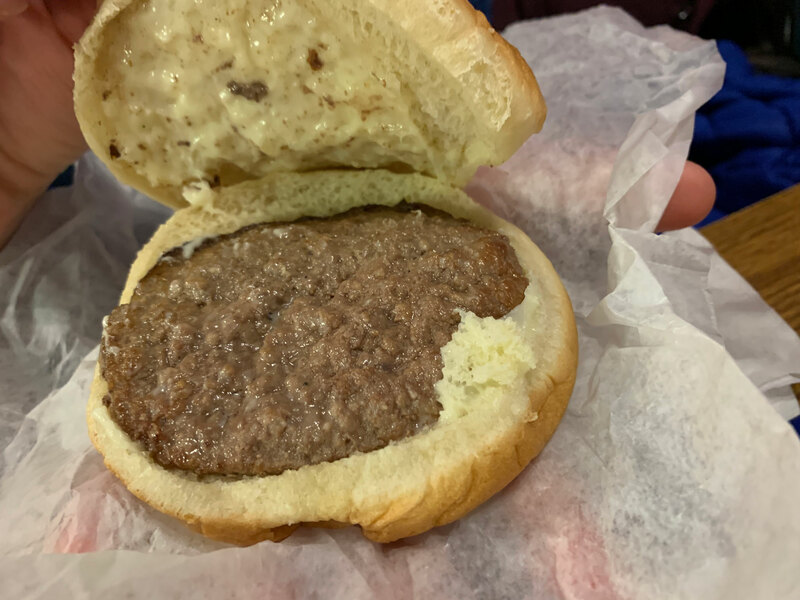 It wasn’t bad, but it’s not going to win any best burger contests. It was also around $2 so we’re not going to complain. Both of us did enjoy our fries. 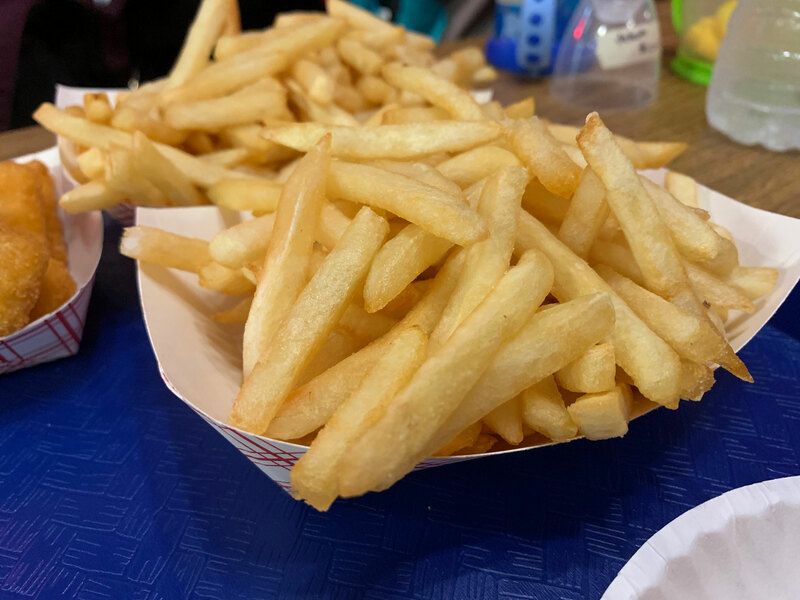 They weren’t anything special, just a really good fast food-style French fry. They were cut small so you could pop several of them at a time. 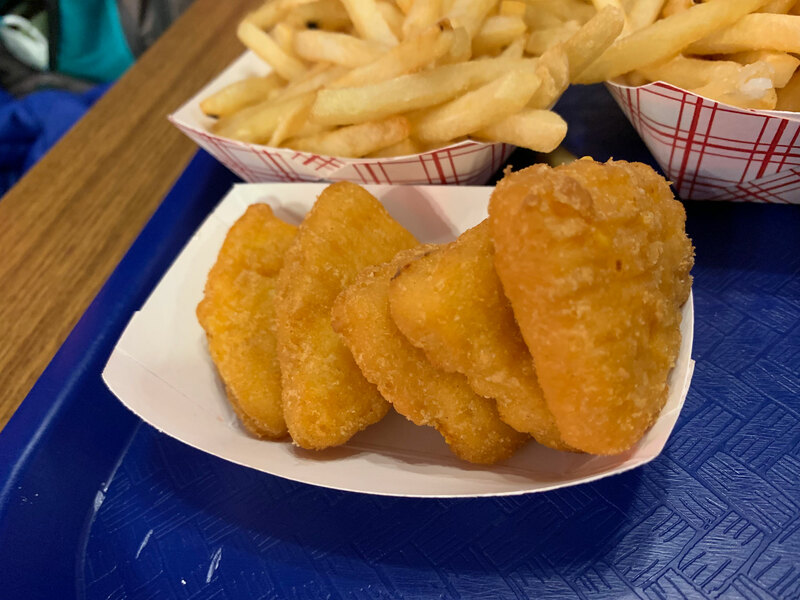 I think their small size allowed them to retain more flavor from the fryer. After adding a little salt and pepper, they were just what we hoped they would be. Jakob, our now one-year-old son, is now at the point that he can have his own food when we go out. So we got him an order for mac and cheese bites. He enjoyed them, eating two out of the five in the order (along with some fries and some duck). Again, nothing special, just a typical fried fast food side. None of us really needed anything else to eat after our dinners, but the ice cream was right there, and we just couldn’t pass up the chance to indulge. I am a sucker for flurries so my go-to on this night was a brownie dough flurry. 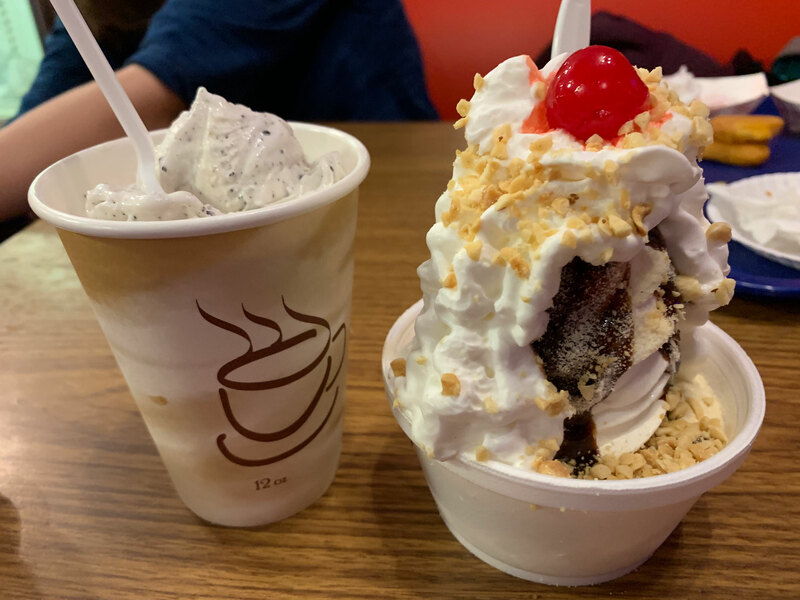 The flurry was actually mixed to the point that much of the brownie had broken off into small bits, making it look more like cookies and cream than brownie dough. But there were still some larger chunks that were definitely brownie. It was delicious, but a small was more than enough for me, especially after indulging at dinner. We spent about $32 on our visit – $22 on dinner and $10 on dessert. The duck items are a little more expensive than the rest of the menu so we easily could have spent less and we easily could have spent more. But overall, it felt like a good value. The service isn’t great (a little slow but not bad), but that’s to be expected when a group of four high school students are handling all of the orders behind the counter. I went in to the meal with an open mind when it came to fast food duck. After eating the pulled duck sandwich, I think you can count me among the believers. And I hope there are more believers out there because this was a sandwich I would like to have again. 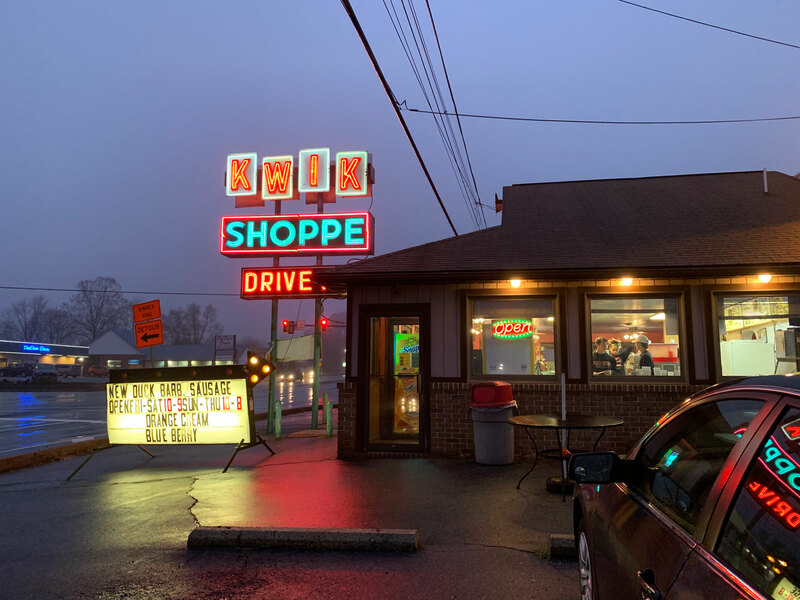 We too, being raised in the area, visit the Kwik Shoppe frequently. Today, we jumped over the edge and tried the pulled duck (hubby) and I had the loaded duck fries. OMW..it was THE BEST ! The fries are done in duck fat..which changes them completely! Add the pulled duck, parm cheese and HOLY DUCK!! It was over the top! I would rate this a 5 star without batting an eye!